This week’s post features a medley that combines three distinct lullabies sung by Esther Korshin in 1946. Yiddish lullabies, as most Yiddish folksongs, are women’s folk poetry. But with the genre of lullaby the element of improvisation plays a bigger role as we see in this week’s post. Esther Korshin, August 1957. Courtesy of Oliver Korshin. 2) This is followed by a Yiddish verse of a lullaby beginning with the line Shluf mayn feygele (Sleep My Little Bird) sung to the same melody as Cossack Lullaby. 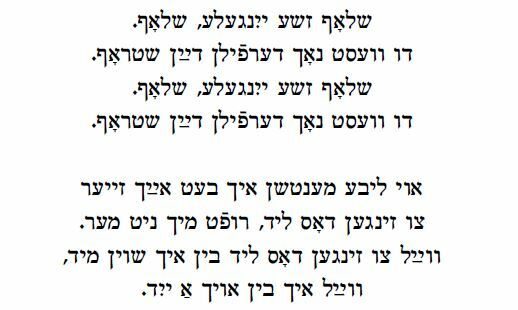 3) The lullaby medley concludes with a different Yiddish lullaby also beginning with the line Shluf mayn feygele. Parts one and two are connected by melody; parts two and three are connected by the lyrics. See below for the recording, notes on the songs and finally the lyrics. The popular Russian lullaby Spi mladenets usually referred to as “Cossack Lullaby” was written in 1840 by Mikhail Lermontov (1814 – 1841). It has been folkorized over the years and Korshin’s version differs slightly from the original poem. The melody was the basis for Yiddish lullabies by Avrom Goldfaden (1840 – 1908) and J. L. Gordon (Yehude-Leyb Gordon 1830 – 1892). See: Ruth Rubin Voices of a People, pp. 260-261. 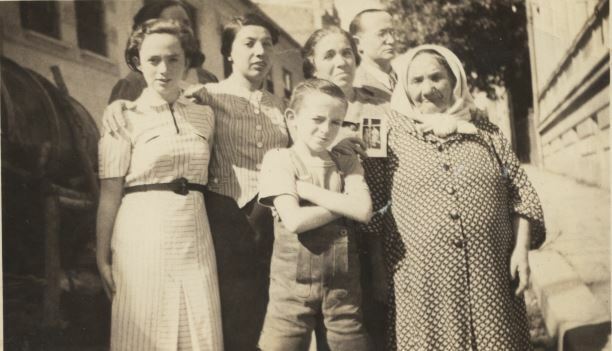 Jewish mothers wished for many things for their sons in Yiddish lullabies but growing up to be a soldier, as in this one, was not one of them. So it is no wonder that such a hope would be expressed in Russian not Yiddish. Her performance of this song reflects how intertwined Russian and Jewish culture were. After concluding the Cossack Lullaby, Korshin switches from Russian to Yiddish to sing two verses with the same melody. This is Goldfaden’s lullaby that originally began with the line “Shlof in freydn” (sleep in peace) and was printed in his collection of poetry Di Yidene (The Jewess, Odessa, 1872) Attached at the end of this post is the complete original poem (Yidene 1, 2, 3). By 1901 it was an anonymous Yiddish folksong in the Ginsburg-Marek collection. A version closer to Goldfaden’s original poem, including music, can be found in Eleonor and Joseph Mlotek Songs of Generations, p. 4. Interesting that in “Shluf mayn feygele 1” Korshin sings “Ay-liu-liu”, one of the Yiddish equivalents of “hush-a-bye” but also the Russian equivalent – “bayushki bayu”, making the connection between the Yiddish song and the Russian one even tighter. 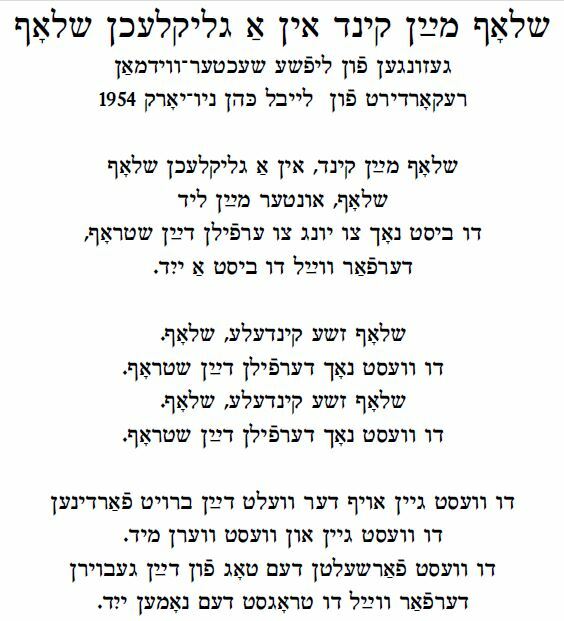 Readers of the Yiddish Song of the Week blog will remember that another lullaby with the first line Shluf/Shlof mayn feygele but a different melody, sung by Lifshe Schaechter-Widman. This is a popular Yiddish lullaby with many variants. Here is a link to another version on the web, sung by Jill Rogoff. For more on Yiddish lullabies see: Dov Noy “The Model of the Yiddish Lullaby” in Studies in Yiddish Literature and Folklore, ed. Dov Noy, Jerusalem, 1986. On the lullaby in Jewish literature and culture, Hebrew and Yiddish, see the entry “Lullabies” by Dov Noy and Aliza Shenhar in Encyclopedia of Jewish Folklore and Traditions. Thanks to Samantha Shokin of the Center for Traditional Music and Dance for the Russian transcription and translation, Jennifer Herring for the recording, and Cantor Janet Leuchter for connecting us with the Korshin family. quietly looking into your cradle. I will embroider with silk.